Where formula is a valid ruby statement that returns a number. Script &apos;custom escape ratio&apos; line 65: NameError occured. undefined method &apos;make_escape_ratio&apos; for class &apos;Module&apos;. You need to place it below Materials. Which should allow me to ALWAYS escape right? Nope, i escape only sometimes. So, i&apos;m asking myself: Is the "alias" ine that removed really importan to the script? Or not? If you remove the line you&apos;re probably not calculating the escape ratio. This script requires you to use the default BattleManager. 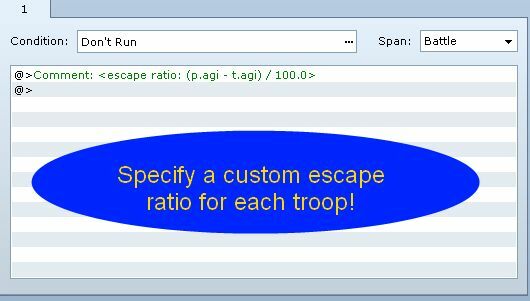 You can set up the troop escape ratio to include variables and then have your item run common events that will set the variable. It is up to you to be creative to figure out how to accomplish it. This script simply gives you the ability to customize the escape rate formulas.